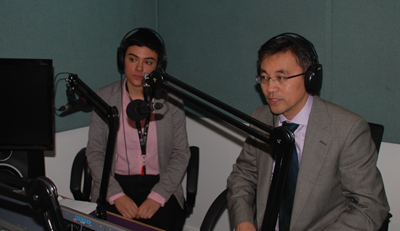 On Nov 3rd, Minister Zhu Qin of the Chinese Embassy in UK gave an interview to SINO Broadcasting Station. Mr Zhu Qin introduced the main content and the historical significance of the 19th National Congress of CPC, recalled the great achievements China made in the last five years and talked about the main challenges China is facing on its way ahead. SINO: We have just seen the 19th CPC National Congress taking place in China. What happened at the Congress? Zhu Qin: The 19th National Congress of the Communist Party of China was successfully held between 18th to 24th Oct. This meeting is truly a historical milestone. The key message is that socialism with Chinese features is entering into a new era. It not only shapes China’s future, but also has a far-reaching impact on the world. First, the Congress adopted the Xi Jinping Thought on Socialism with Chinese Characteristics for the New Era. This is the latest adaptation of Marxism to the Chinese context. It is the CPC’s understandings of the laws of social progress of mankind and it answers the question of how to adhere to and how to continue building socialism with Chinese features. Second, the Congress rolled out a blueprint for China’s future development. After decades of hard work, the CPC solved the subsistence issue for over one billion people. According to the goals set out by the Congress, China will put in place a moderately prosperous society in 2020, realize socialist modernization by 2035, and build China into a great modern socialist country that is prosperous, strong, democratic, culturally advanced, harmonious and beautiful by the middle of this century. Thirdly, the Congress elected the new CPC central leadership. In a big country like China, development and progress would be impossible without strong leadership. The new CPC central leadership with Xi Jinping at its core is confident and determined in leading the Chinese people into a new era and realizing the Chinese dream of national rejuvenation. I think a stronger and wealthier China will stay committed to the path of peaceful development for mankind, work for the building of a common community of shared future and make more contribution to the development of the whole world. SINO: There is a bit of discussion about the changes in China in the last five years. 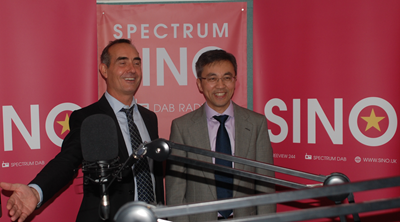 What kind of changes have that been in China in the last five years and how we see that reflected in the Congress? Zhu Qin: In the past five years, China has made remarkable all-around achievements and also widely-recognized contribution to the world. The achievements of the past five years have touched upon every area and broken new ground, and the changes in China over the past five years, we can say, have been profound and fundamental. In the field of economic development, we have worked to deepen reforms comprehensively and implemented new visions for development. China’s economy ranks the second in the world and contributes to over 30% of world growth. China has been one of the leading nations in trade, overseas investment and foreign reserve. In the field of life improvement, China has followed through a number of policies to deliver tangible benefits to the people, boosting their sense of fulfillment, happiness and security. In the past five years, more than 60 million people were lifted out of poverty and more than 13 million urban new jobs have been created. Middle income class is expanding. More and more people in China enjoy much better health and medical services and facilities. Steady progress is also being made in building affordable housing. In the meantime, China is strengthening institutional building and exercising full and rigorous Party self-discipline. We have acted with resolve to “take out tigers”, “swat flies” and “hunt down foxes”. With the strong backing of the Chinese people, China’s anti-corruption drive has gained an overwhelming momentum. I think China’s success offers other countries and nations a new path from development to modernization. This is an example of China’s wisdom and solutions in response to the challenges of the whole world. SINO: What kind of challenges do you think China is facing going forward? Zhu Qin: While recognizing the great achievements of our country, we are also somber-minded of the challenges and difficulties ahead. Our major task is to address the unbalanced and inadequate development in order to meet the people’s ever-growing need for a better life. I am referring to the fact that growth still needs a stronger and self-sustaining momentum, economic and financial risks requires serious attention and pollution remains a daunting challenge. In the fields of housing, education, health, pension, food and drug safety, income disparity, there is still much room for improvement. Beyond China, the world today is short of growth momentum. Regional hot spots are cropping up and unconventional security threats such as terrorism, cyber security and climate change are looming large. Those are the external challenges that we have to face. To address the above challenges, China will work hard to improve the quality and efficiency of its economic growth, meet the people’s growing need in the political, economic, cultural, social and environmental fields, and to deliver well-rounded development for every individual and social progress in all aspects. At the same time, China will stay committed to the path of peaceful development and opening-up in order to build a community of shared future for mankind. China as a big country will play a responsible role in the reform and development of the global governance system and continue to contribute its part to world peace, development and prosperity. SINO: Thank you very much.